A molecular model of a new metal organic framework (MOF) which selectively traps xenon, a gas that is released during reprocessing of nuclear fuel. RICHLAND, Wash. — Researchers are investigating a new material that might help in nuclear fuel recycling and waste reduction by capturing certain gases released during reprocessing. Conventional technologies to remove these radioactive gases operate at extremely low, energy-intensive temperatures. By working at ambient temperature, the new material has the potential to save energy, make reprocessing cleaner and less expensive. The reclaimed materials can also be reused commercially. "This is a great example of computer-inspired material discovery," said materials scientist Praveen Thallapally of the Department of Energy's Pacific Northwest National Laboratory. "Usually the experimental results are more realistic than computational ones. This time, the computer modeling showed us something the experiments weren't telling us." To find the best MOF for xenon and krypton separation, computational chemists led by Haranczyk and Smit screened 125,000 possible MOFs for their ability to trap the gases. Although these gases can come in radioactive varieties, they are part of a group of chemically inert elements called "noble gases." The team used computing resources at NERSC, the National Energy Research Scientific Computing Center, a DOE Office of Science User Facility at LBNL. The team's models identified the MOF that trapped xenon most selectively and had a pore size close to the size of a xenon atom — SBMOF-1, which they then tested in the lab at PNNL. After optimizing the preparation of SBMOF-1, Thallapally and his team at PNNL tested the material by running a mixture of gases through it — including a non-radioactive form of xenon and krypton — and measuring what came out the other end. Oxygen, helium, nitrogen, krypton, and carbon dioxide all beat xenon out. This indicated that xenon becomes trapped within SBMOF-1's pores until the gas saturates the material. Although the researchers showed that SBMOF-1 is a good candidate for nuclear fuel reprocessing, getting these results wasn't smooth sailing. In the lab, the researchers had followed a previously worked out protocol from Stony Brook University to prepare SBMOF-1. Part of that protocol requires them to "activate" SBMOF-1 by heating it up to 300 degrees Celsius, three times the temperature of boiling water. 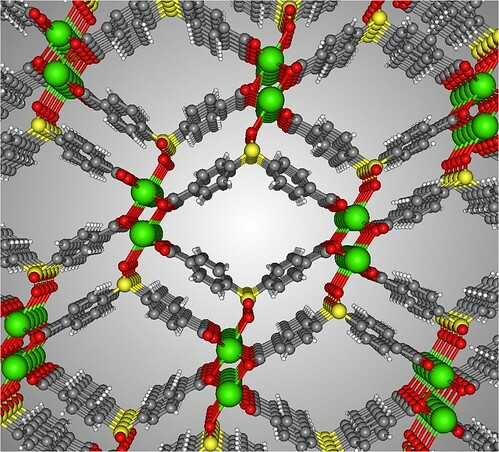 Reference: Debasis Banerjee, Cory M. Simon, Anna M. Plonka, Radha K. Motkuri, Jian Liu, Xianyin Chen, Berend Smit, John B. Parise, Maciej Haranczyk, & Praveen K. Thallapally, Metal-Organic Framework with Optimal Adsorption, Separation, and Selectivity towards Xenon, Nature Communications June 13, 2016, DOI: 10.1038/ncomms11831.